BOSTON (AP) — Anyone who can’t make it to the moon to gather a few lunar rocks now has the opportunity to buy one right here on Earth. A 12-pound (5.5 kilogram) lunar meteorite discovered in Northwest Africa last year is up for auction by Boston-based RR Auction and could sell for $500,000 or more during online bidding that runs from Thursday until Oct. 18. 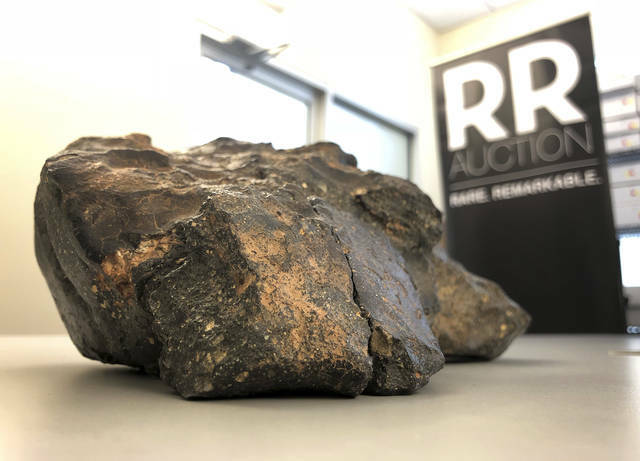 It is “one of the most important meteorites available for acquisition anywhere in the world today,” and one of the biggest pieces of the moon ever put up for sale, RR said. The rock classified as NWA 11789, also known as “Buagaba,” was found last year in a remote area of Mauritania but probably plunged to Earth thousands of years ago. Most lunar meteorites found are the size of a walnut or golf ball, said Geoff Notkin, star of television’s “Meteorite Men” and CEO of Aerolite Meteorites, which is selling the rock. It is also one the few known lunar meteorites with what experts call “partial fusion crust,” caused by the tremendous heat that sears the rock as it descends through the atmosphere. “It actually toasted on the outside,” Notkin said. Another thing that makes it different from most meteorites is that it is “unpaired.” Sometimes different pieces of the same meteorite are discovered at different times, and those examples are known as “paired.” An “unpaired” meteorite is more desirable to collectors and perhaps more valuable to science. The meteorite would be a nice addition to any natural history museum, but don’t be surprised if a private collector snaps it up, said Robert Livingston, RR’s executive vice president. 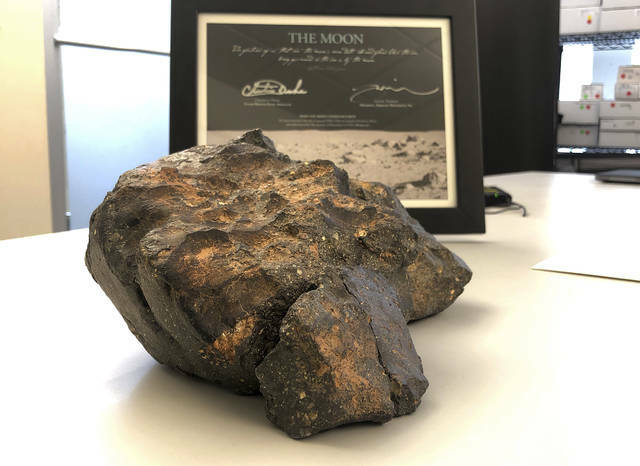 “This is the only way a private collector can get their hands on a piece of the moon because the moon rocks brought back by astronauts are U.S. government property,” he said. Joe Essid does not work for, consult, own shares in or receive funding from any company or organization that would benefit from this article, and has disclosed no relevant affiliations beyond their academic appointment. The film “First Man,” starring Ryan Gosling as Neil Armstrong, may boost public recognition of Armstrong’s name and career. But his fate after his “giant leap for all mankind” mirrored that of public interest in the moon landings and, broader still, trust in government, which has steadily eroded since the early 1970s. It may be hard to imagine today, but from the early 1960s until Apollo 11, Congress essentially gave the space agency blank checks to fulfill the Kennedy administration’s goal of a man on the moon by 1970. In the mid-1960s, NASA received over 4 percent of the federal budget. Today, it’s funded with less than 0.5 percent of the budget. Furthermore, for a few ephemeral years, a factious nation thought of itself as a space-faring people. With a populace hurting from the Tet Offensive, the assassinations of Martin Luther King Jr. and Bobby Kennedy, and the riots of 1968, the moon landing managed to make us stop arguing – albeit briefly – and look up at the sky. America quickly turned its back on Apollo and began its long, painful slide into Watergate and Vietnam. By the end of the 20th century, conspiracy theories about the moon landing abounded – that the astronauts had never left Earth’s orbit; that Stanley Kubrick had played a role in faking the Apollo landings on a sound stage. Those once mesmerized by NASA’s stillborn plans for lunar bases and manned flybys of Venus wanted more – so much more – out of Armstrong. When he was chosen for Apollo 11, Armstrong was already one of the most talented test pilots in history. As Andrew Chaikin notes in his book “A Man on the Moon,” Armstrong “got his pilot’s license before he learned to drive,” then in the 1950s and ‘60s actually flew the X-15 rocket planes, supersonic fighter aircraft and Gemini capsules that my NASA-obsessed peers glued together in 1:48 scale, following Sputnik in 1957. After walking on the moon and right into the afterglow of fulfilling JFK’s promise, what more could America’s “first man” have done? Tom Wolfe, author of the epic account of the U.S. space program, “The Right Stuff,” argued that “NASA had neglected to recruit a corps of philosophers.” Wolfe hoped that wordsmiths with the ability to excite and inspire might be the ones flying into space. Wolfe liked the vision and ambition of Wernher von Braun, architect of the Saturn V moon rocket, who famously said, “I have learned to use the word ‘impossible’ with the greatest caution.” Unfortunately, the engineer had a bit of an image problem related to his Nazi past. Armstrong, for his part, wasn’t the best with words. Even as he made his initial small step off the ladder, he seemed to wrestle with his tongue. Or the radio link to Earth garbled his sentence. We’ll never know. In our era of incessant self-promotion and celebrity billionaires, I wonder if there’s a place for a humble yet insanely focused national hero like Armstrong. Ryan Gosling’s portrayal may offer a glimpse of the Neil Armstrong we never really knew. Perhaps the film will inspire moviegoers with the sort of ambitious visions NASA had in the mid-1960s. At the very least, it will remind us of a time when government functioned well enough to achieve something momentous. Could the same be done for reversing the effects of climate change? Or the more humble job of rebuilding our nation’s infrastructure? For now, fixing potholes seems to be a job left for Domino’s Pizza. COLUMBUS, OH – Changes to bag and size limits for fish in certain bodies of water were among the regulations approved by the Ohio Wildlife Council at its scheduled meeting on Wednesday, October 10, according to the Ohio Department of Natural Resources (ODNR). Mark Bourassa has received support from NASA and NOAA. Hurricane Michael, an unprecedented Category 4 hurricane, has made landfall in the panhandle region of Florida. This is an updated version of an article originally published on Sept. 12.